Dynamic Seating moves in response to client forces. Many clients move, not due to increased extensor tone, but rather for the explicit purpose of moving. We all tend to seek out movement. We are wired to move and movement has so many benefits. Movement can calm, arouse, work muscles and provide comfort by varying our position. From a sensory standpoint, movement provides vestibular input. The vestibular system is responsible for processing movement, changes in head position, and direction and speed of movement. The vestibular system is in the inner ear. When the vestibular system is activated, the brain is both calmed and aroused. This means that an agitated client may calm when the vestibular system is activated and a sub-aroused client may become more alert. One study showed that clients with dementia who were agitated, calmed in response to rocking. Other clients with dementia who were sub-aroused became more alert and responsive after rocking. Static seating does not move with the client. The client may be able to move within and separate from the wheelchair seating system, but the more restrictive the seating system is, the less the client will be able to move in it. A dynamic wheelchair moves with the client, providing postural support and stability during movement. Some movement-seeking clients rock with such force in a static seating system that they can actually “bounce” the wheelchair across the room! This force can lead to breakage and tipping the wheelchair and user, a potentially dangerous situation for the user and others. Dynamic seating, particularly at the back, can absorb these forces. 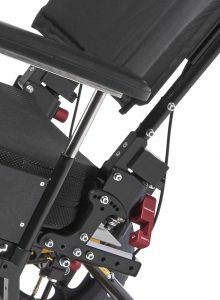 See our next blog for a case study on the vestibular benefits to using dynamic seating wheelchairs!